Have pizza oven, will travel. 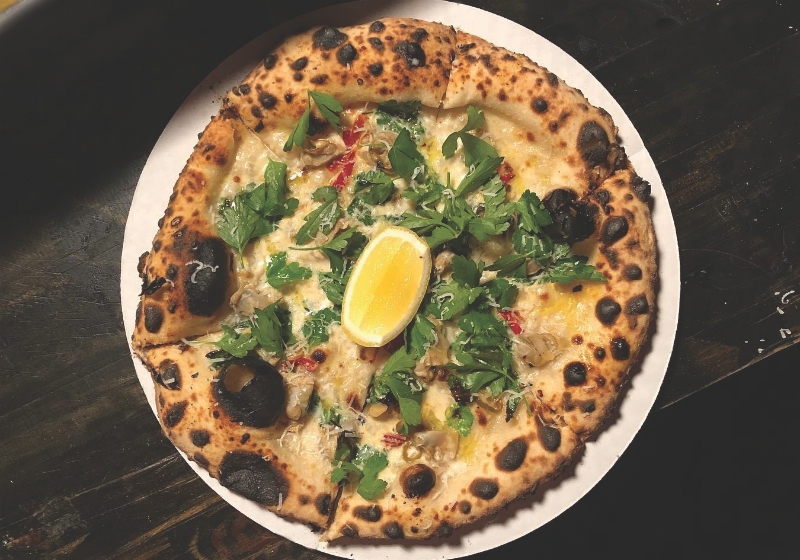 That could well be the motto of La Morra Pizzeria, a portable wood-fired-pie outfit run by Charleston expats Zach Swemle and Marlee Blodgett. The couple made a name for themselves in South Carolina’s booming culinary scene, cooking Neapolitan-style pizzas in a ceramic-tile oven that Swemle built by hand and mounted on an old flatbed trailer. Last summer they decamped for the West Coast, hauling the dome-shaped beast cross-country to its new home in Los Angeles. Swemle and Blodgett hope to eventually open a brick-and-mortar location, but for now La Morra pops up Tuesday nights at Hayden in Culver City and Thursday nights at Tabula Rasa Bar in Los Feliz. Made with tangy, naturally fermented dough, La Morra’s flavorful crust puffs up with a freckled char and the right amount of elasticity. The menu usually consists of a handful of excellent topping combinations—spicy soppressata with a drizzle of honey, lamb sausage with herbed yogurt, oyster mushrooms with fontina and sliced shallots—but most compelling is their famed Clam Pie, an Eastern Seaboard-inspired special topped with briny-sweet littleneck clams, a drizzle of cream, hot Calabrian chiles, parsley, and a flurry of shaved pecorino. Squeeze the accompanying wedge of lemon over the top, and dive in.